That's not a ladder and it sure isn't a trellis for your Jasmine. Did you immediately recoignise the object in this photo? Posted in General and tagged buildings on Sunday, 14 August, 2011 by Paul. Sure, it’s a grain mill Deems. It’s not Mostert’s one though. This one’s located in Durbanville. 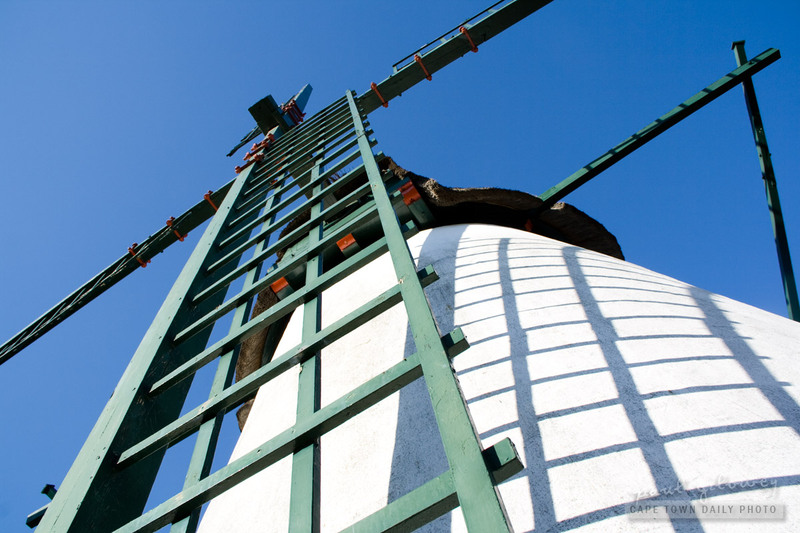 oh i thought it was the windmill you see when you drive on that road tomuizenberg from de waal drive… I think its the m3, im not sure cos im not good with road names. Neither did I Deems! I did a double-take when I spotted it down a side street. RiD1, yeah, that’s the one that I thought everyone would think it was. But no no – I’ll post another pic in a sec or three. Craig – a lighthouse with a weird-trellis running down the side? :P I know the lighthouse that you’re thinking of. It’s interesting how obvious it seems to me (that it’s a mill) but then I’ve seen the full picture so it’s difficult for me to see it as anything else. Any one of you old enough to remember Spotty Dog on the way to Muizenberg? It was a snack bar built to resemble a dog. Unfortunately it was torn down. Another landmark gone.